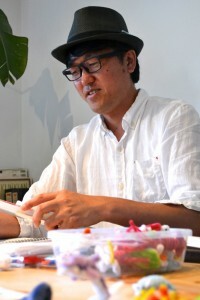 Until about 5 years ago, Atsushi Kitanaka had been living and working around Kustatsu as a seasoned designer for both architecture and web firms, having embarked on a career path inspired by heroes such as the Bauhaus designer, Marcel Breuer, and following the underlying Bauhaus modernist concepts. 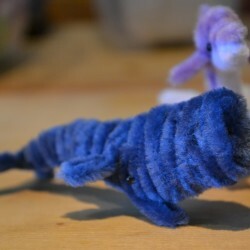 So how did all of this lead to pipe cleaners? 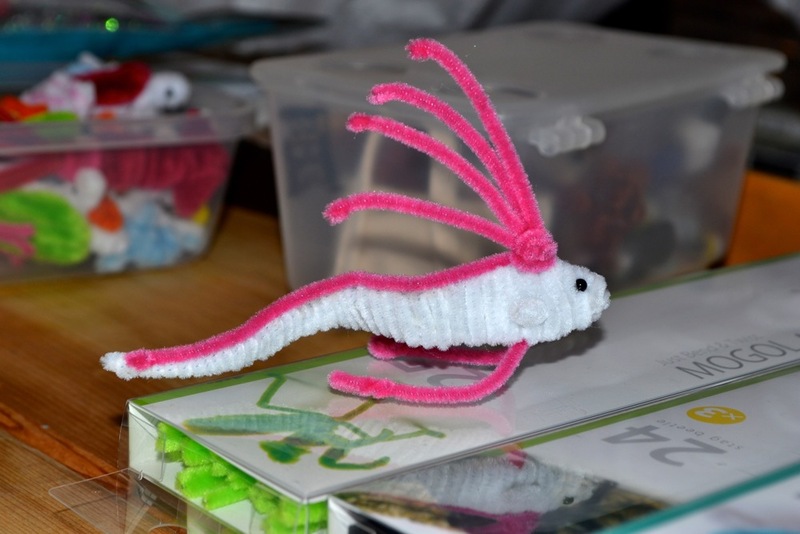 Well, one of his clients, a Kyoto-based pipe cleaner manufacturer, needed help in broadening their market reach, which lead to a house full of pipe cleaners as Kitanaka-san began physically working through ideas. His son had been using them, as many children do, to craft decorations and play things. 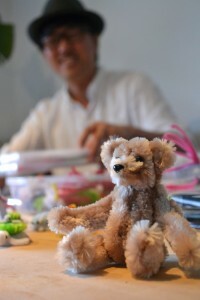 Kitanaka-san first noticed his knack for pipe-cleaner craft when his son asked for help in constructing a hamburger. 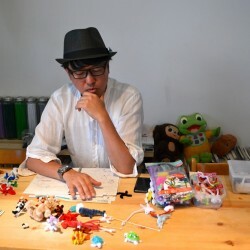 This became the impetus for a wider vision, with an eye toward the craft resurgence brought on by Instagram, Etsy (or Japanese equivalent), cool Japan, “kawaii” culture, etc., in which a well-designed pipe cleaner hamburger holds considerable value. 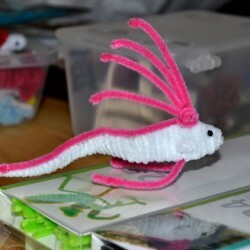 He began working alongside the manufacturer, originally selling his own pipe cleaner creations and hosting workshops to help spread the craft to children and creative types. 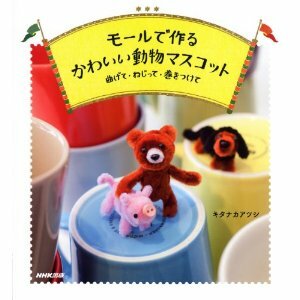 This soon lead to photo books of his work (available on Amazon), which generated more publicity and lead to his current business model, in which he no longer sells his own creations, but is rather selling kits for people to recreate his designs using step-by-step instructions. 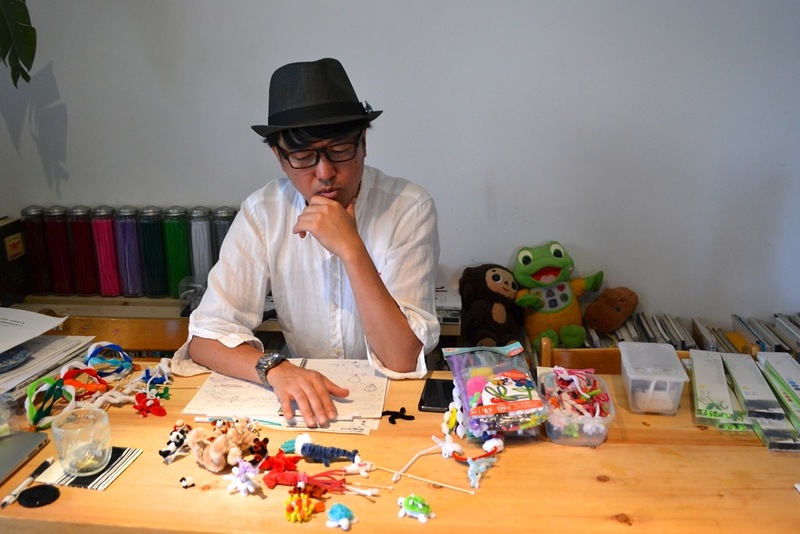 Like origami, his creations involve just folds and bends, no cutting, as well as common fold patterns and steps reused throughout the various works. 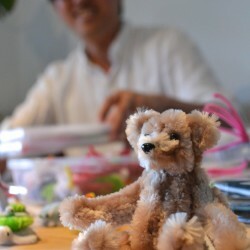 He continues to hold regular workshops to demonstrate his techniques, and is amassing an ever-growing collection of individual project kits (currently around 45) that you can find in select department stores, but probably more easily on his website, craftjam.jp. We arranged a short visit to Kitanaka-san’s home studio recently for this article, not only to share some of the most amazing pipe cleaner creations we’ve ever seen, but also to shed some light on the interesting things going on in our back yard seemingly unnoticed. 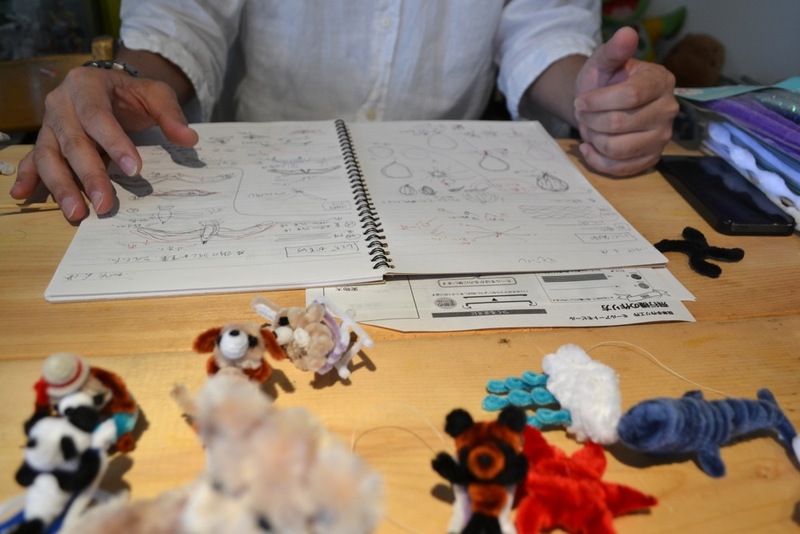 He admitted that despite doing many workshops in Tokyo, Osaka, or in the US and overseas, he currently only has a couple local Shiga workshops per year now and isn’t as well known locally. 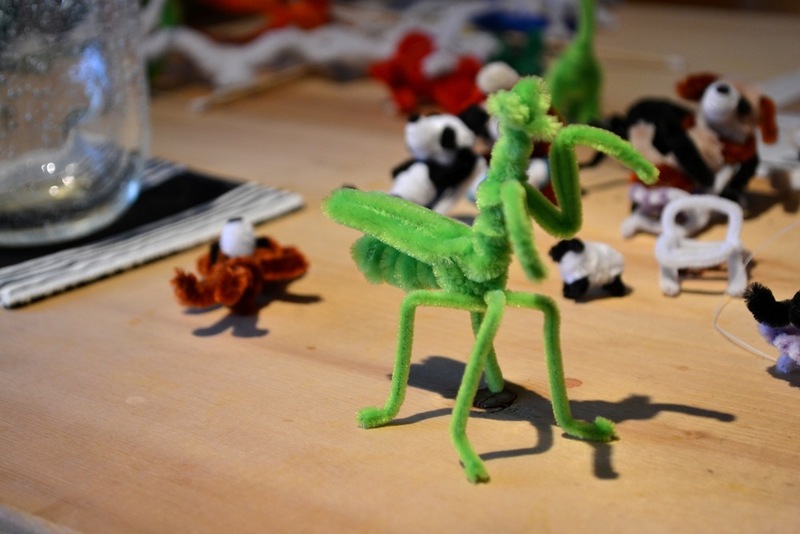 As we sat down and took a closer look at these tiny creations, I was drawn to the deceptively simple-looking designs. Coming from an art background myself, I knew that a lot more went into these than one might assume, but after looking at the step-by-step instructions included with the kit versions, I could begin to appreciate not only the time and effort of construction, but also the amount of creative planning that goes into each kit. This is undoubtedly one area where his design skills shine; whereas an artist may produce a one-of-a-kind work, a designer has the added discipline of documenting the process, and considering how well the steps will perform in production. This leads me to another question I had going into the conversation: Why the focus on child-friendly kits and workshops? He has done some more advanced pieces, and privately commisioned works (including a miniature Aslan made for the Japanese release of the Chronicles of Narnia films), so why not exploit the Etsy craft boom to sell more advanced original works. 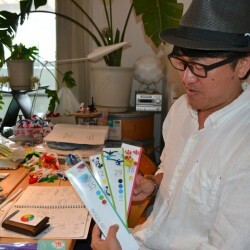 But the answer he gave ties back to his original goal of helping the Kyoto manufacturer that got him started; he is more interested in building the craft as a whole and developing an awareness of pipe cleaner craft that goes beyond the world of glue guns and popsicle sticks that most of us associate them with. In keeping the designs easy enough for children to reproduce, and hosting workshops to teach the craft, he is working to build the artform from the bottom up rather than the top down. 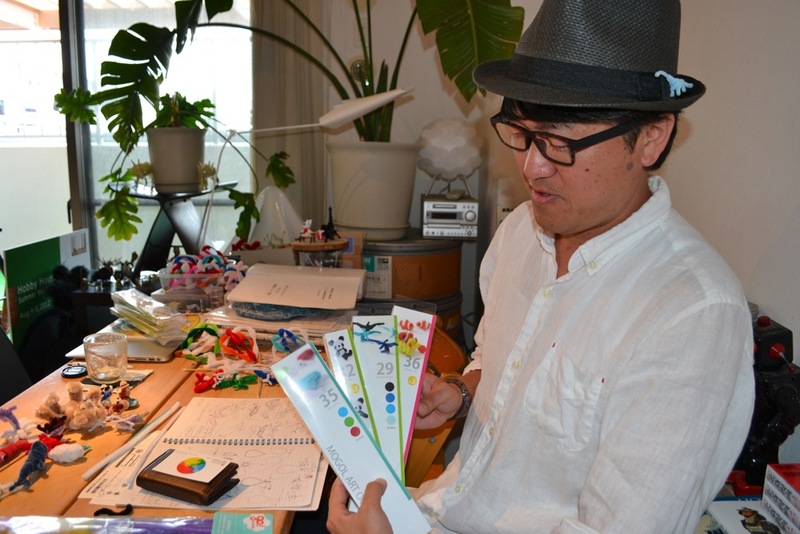 It was inspiring to see how far this has taken him in just the past 4 years or so; he has already made numerous international appearances, shown his works on national NHK broadcasts, published books, been featured on local TV specials, etc. After concluding our chat, we couldn’t turn down his parting gift of one of the individual kits. So we went with the classic panda, thinking it would balance the cutest outcome with the least amount of effort! The kit contains enough pipe cleaners to make 3 pandas so my wife, Takako, also tried her hand at one. As someone who has tried and failed at a lot of origami instructions, this was a familiar challenge. 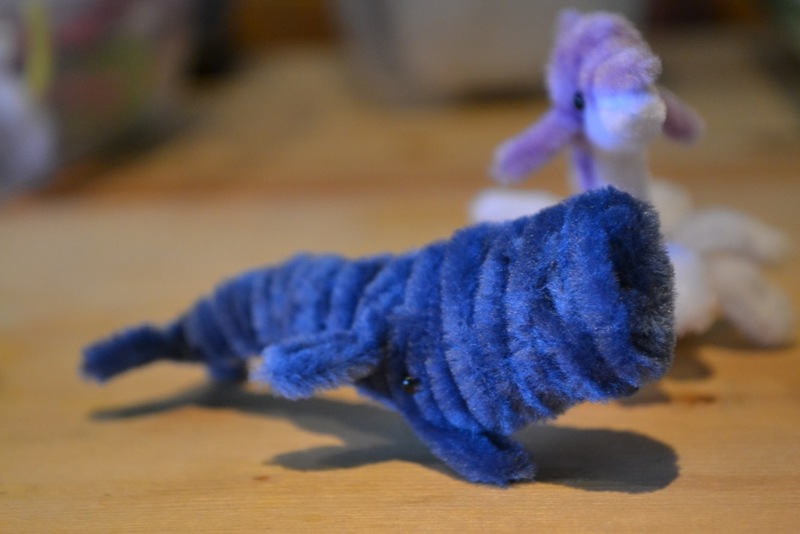 But one advantage of pipe cleaners over origami is that when you screw up, it’s easier to fake your way to a passable proximity in the end. 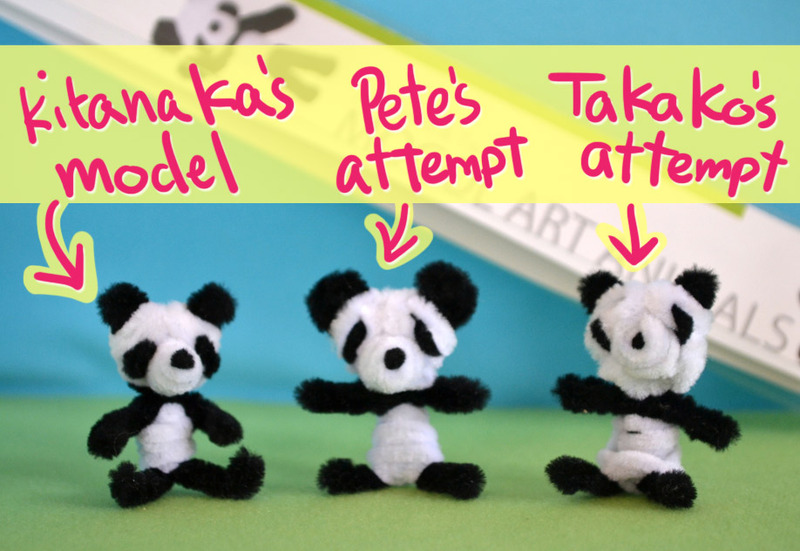 I took a few artistic liberties along the way and ended up with what what appears to be a sad panda with an eating disorder; Takako’s is similarly misshapen, maybe it was attacked by my panda. 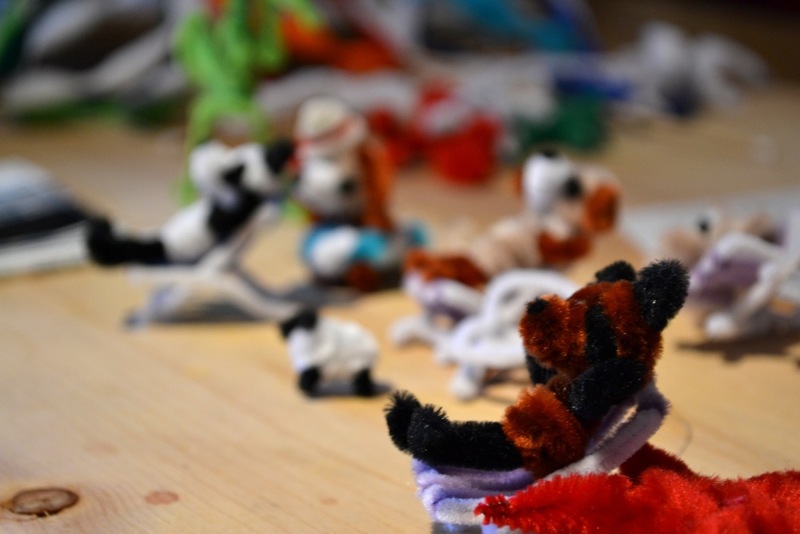 Anyways, despite our subpar results, it was fun wrestling the pipe cleaners into place, and moreover a testament to the skill of master Kitanaka-san. I’m sure that we could level up more in a proper workshop, but having the kit to work from at least made it easier than starting from scratch. I think these kits are a great tool both for people who lack creative skills, but also for creative folks who want to build a foundation in the craft before moving on to more complex original projects. Who knows, maybe I’ll have my own Etsy shop one day! We’ll leave you with some more examples of his work below (click for larger images), but you can see many more examples over on his website, and keep an eye out for his workshops if you’re interested in mastering the craft.